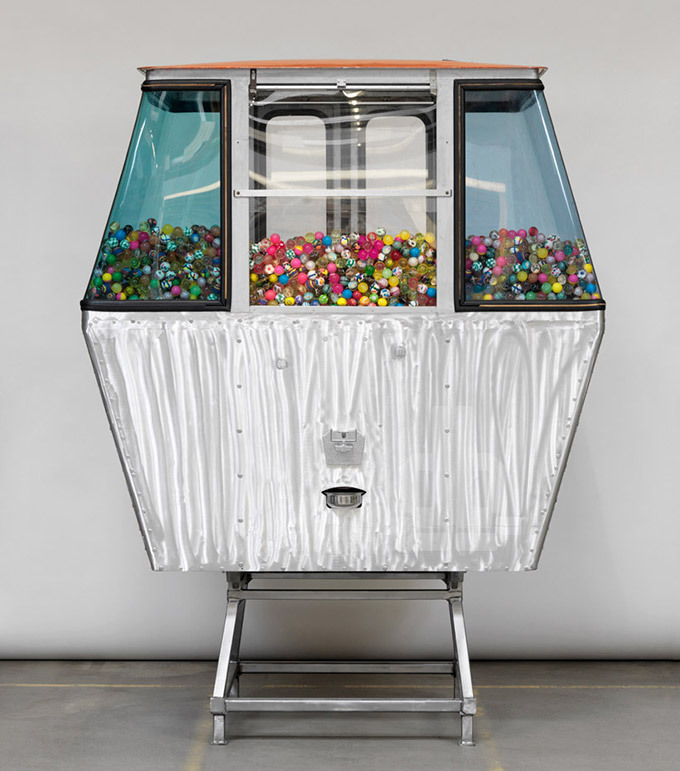 This awesome piece was one of the designs on show at the Design Miami/Basel 2013 show. 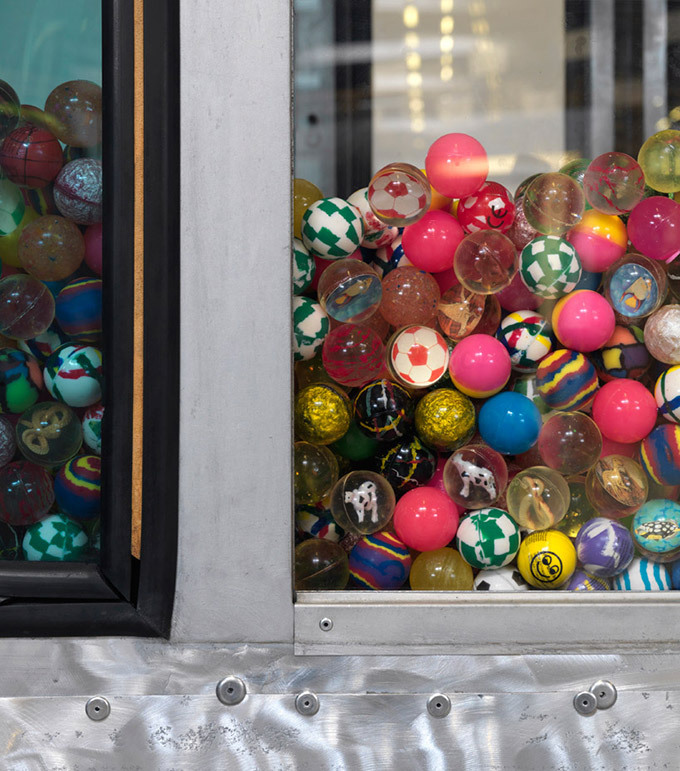 Baker Wardlaw has turned an old gondola lift car from Verbier ski resort into a bouncy ball vending machine. 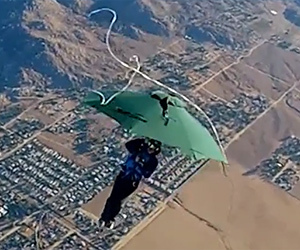 Skydiver Erik Roner decided to put the Mary Poppins floating umbrella theory to the test. Can he float gently to the ground? Think he’s going to need a bigger umbrella. A backup parachute is defiantly a good idea. 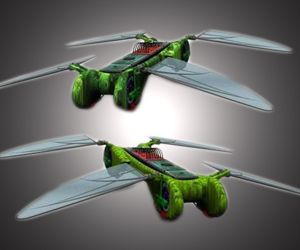 The TechJet Dragonfly is a Wi-Fi robot that can fly & hover like a real-life dragonfly. HD camera options & flight computer, 4-Wing mechanism & impressive flight time of 25-30 minutes. 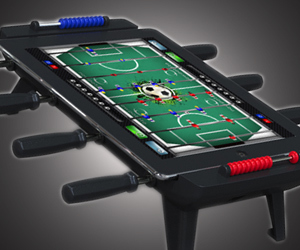 Customisable & upgradable. 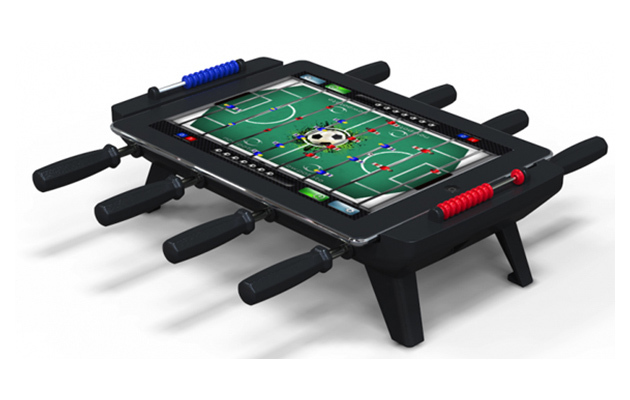 New Potato Technologies brought us the Jackpot Slots Fruit Machine & Fruit Machine accessories for the iPad, now they have made a fully working Foosball table, working with the free Classic Match Foosball app. 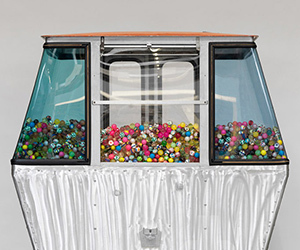 Jonathan Trappe from North Carolina became the first man to fly across the English channel using a cluster of ballons. 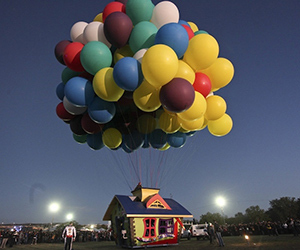 Now he has a flying balloon house. 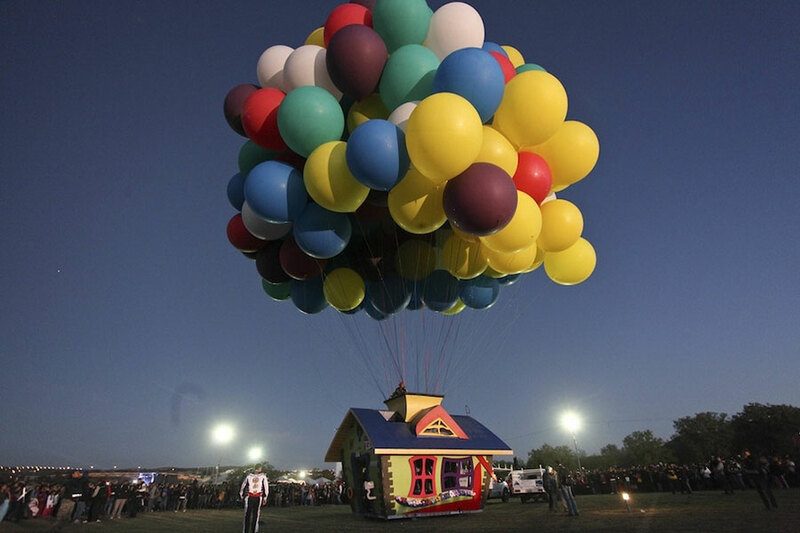 He flew it over the International Ballon Festival in Leon, Mexico. These guys hire a van & drive around Utah filling it with tones of leaves, 1462 bags, to be exact. 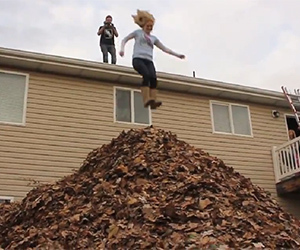 They then make a 17 foot tall pile & jump off their house into it. 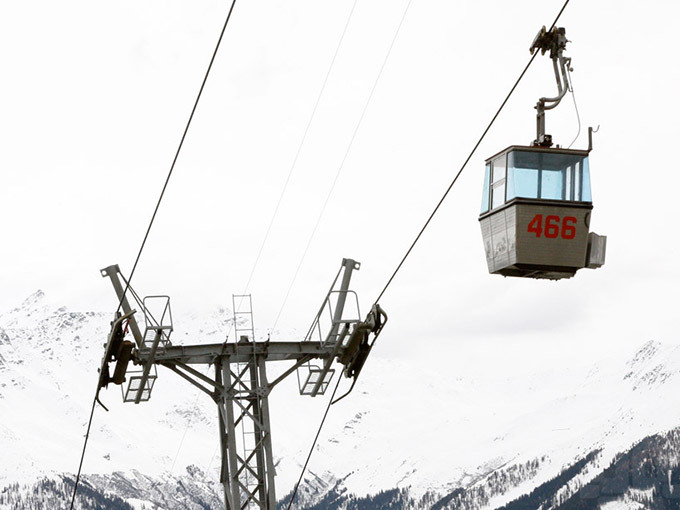 Looks ridiculously fun, we want in on the action. 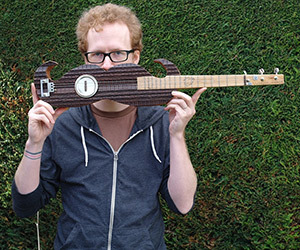 Tom Fox has made a unique moustache guitar for the Movember campaign, 100% recycled parts include a shoe polish tin, picture frame and a Piano stool leg. 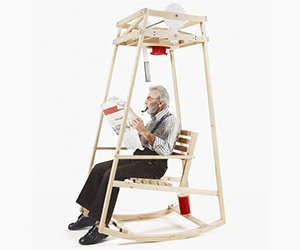 It’s going to be auctioned on eBay starting 20th November. 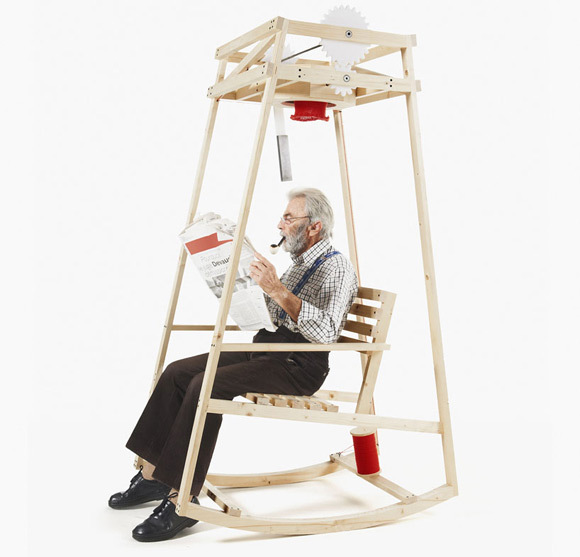 This piece from the University of Art and Design Lausanne is a rocking chair with a twist, as you rock to-and-fro the energy is used to knit hats, this happens above your head. Amazing what a bit of rock can do. 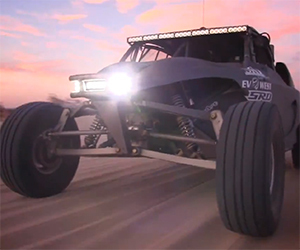 This beast from by Bilstein and Strategic Racing Designs runs entirely on electric juice, powered by 2 NetGain 9” motors, hot swappable 230V batteries. 100 mile range with 5 hours charge. 500hp, 750 lb torque. 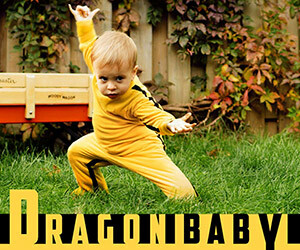 Director Patrick Boivin has made a Game of Death inspired short film, staring his son as Bruce Lee, up against a 3D animated stuffed dragon. This is one epic fight scene. 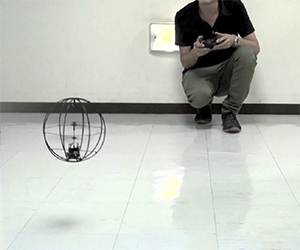 This flying ball will bounce off your walls all day long without needing new blades, it’s a remote controlled helicopter inside a cage. The Kyosho Space Ball has 360 degree movement & features a fragrance sprayer. 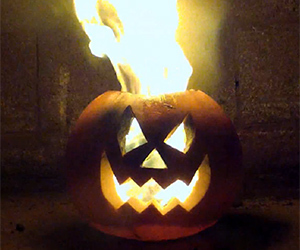 The usual way to light up your pumpkin is with a little candle, Youtuber DaveHax has livened things up with a toilet roll and large dowsing of kerosene. The result is effective and lasts for a couple of hours.